Working hard. 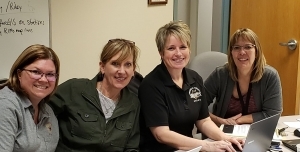 The public information officers for the McKay Creek Flood are Suzie Reitz of the East Umatilla County Rural Fire Protection District, Donna Biggerstaff of the city of Pendleton, and Jodi Florence and Sterrin Holcomb of the Umatilla County Sheriff’s Office. PENDLETON, Oregon – A community meeting to discuss the McKay Creek Flood will be held at 6 p.m. today at Sherwood Heights Elementary School. Umatilla County Commissioner John Shafer says one of the goals is to separate the truth from the rumors about the event. They won’t be the only officials attending the meeting. Once damage assessments are complete, there is a possibility the state could issue a state of emergency declaration for the county. Oregon Emergency Management declined a request made earlier this week that also included flooding in Wallowa County that was made by Sen. Bill Hansell (R-Athena) and Rep. Greg Barreto (R-Cove). In the latest release from the Umatilla County Emergency Operations Center, it’s reported that the state fire marshal returned command back to local authorities yesterday afternoon. Pendleton and the county continue to partner during the transition to what they refer to as the recovery stage. Struve Bridge at Kirk Extension is now open for resident-only access. The report also stated that waters are flowing freely below the private bridge that had been threatened near the city’s wastewater treatment plant. Officials say it is still recommended that sandbags remain in place. The U.S. Bureau of Reclamation provided a statement in the latest release. It appears here verbatim. “McKay reservoir is authorized primarily for irrigation purposes, with a limited amount of storage for flood control purposes. This spring, with the much higher than average snowpack, McKay reservoir was kept below the normal full capacity to capture increased runoff, in addition to forecasting with the best available historical knowledge of past spring storms. “Two back-to-back rain events in the McKay Creek watershed produced unprecedented precipitation totals. The over 3 inches of rain produced by rain events is well above the monthly average total for the entire month of April. These storms generated more runoff than was available in the remaining storage of reservoir for flood purposes, while keeping outflows within the downstream safe channel capacity for the community of Pendleton downstream. “An interagency team was established to collaboratively make decisions on increasing releases. The team comprises Reclamation officials, the Umatilla County Sheriff, Umatilla County officials, the City of Pendleton, NOAA Northwest River Forecast Center and the National Weather Service. This interagency team has met regularly to receive updates on changing conditions and forecasts that inform timely and accurate decisions on operations. As flood damages are being assessed, the National Weather Service is looking ahead at the days to come, beginning with the forecast for today and tomorrow. She said the longer-range forecast calls for several weather patterns to move through the region.